MANUAL OPEN STICK UMBRELLA. BLACK J HOOK HANDLE. BLACK BACKGROUND WITH LIGHT BLUE FLOWERS. ) 2016-11-22. d 4 ( 231. ) 2016-11-12. Exactly as described. r m ( 260. Founded in 1956 by engineer and inventor Arnold Fulton in a small factory in London, Fulton has grown to become the largest supplier of umbrellas and rainwear accessories in the UK today. Patented extended runner for ease of opening and closing. Deep transparent PVC cover for ease of vision when walking. As used by the Queen! Span when open approx 89cm. Length including handle 94cm. 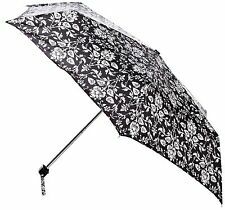 Stylish compact umbrella in classic patterned print with matching slimline case. - Compact umbrella with matching case. - Large 90cm canopy. Exceptionally compact, flat umbrella that fits into the palm of your hand. - Span when open: 85cm. - Flat compact matching case designed for easy fit. - Ultra compact flat shape. Span when open: 86cm. - Cylindrical compact easy to use case with side fastening. The Bloomsbury Double Canopy Umbrella by Fulton features a plain black outer canopy, and an inner canopy with a beautiful floral print. Span when open approx 92cm. Length including handle 84cm. A beautifully-crafted, sophisticated ladies walking umbrella. All our products have been supplied directly from the manufacturer. Exceptionally compact, flat umbrella that fits into the palm of your hand. - Weight approx 160g. - Super-lightweight high performance polyester fabric. Navy blue with highlights of yellow, all on a cream background, the Snakehead Navy design by Morris & Co is printed beautifully on this minilite umbrella. This Morris & Co Folding umbrella can revert to its normal shape, by just closing the canopy and then opening up the umbrella as normal. – Fulton’s exclusive safety handle design prevents accidental opening. Ultra portable, automatic umbrella that never opens accidentally. – Convenient and slim umbrella that fits easily into your bag. – Only 25cm long and 5cm wide yet still opens to a full size umbrella. Unique flat design, lightweight manual folding umbrella by Fulton Umbrellas in high performance polyester pongee fabric. Span when open approx 96cm. Length including handle 22cm. Unique flat design. Morris & co. lightweight manual folding umbrella by Fulton Umbrellas. Small birds stealing strawberries on a blue and green foliage printed canopy. To revert to its normal shape, close and then open the umbrella. The Bloomsbury Double Canopy Umbrella by Fulton features a plain black outer canopy, and an inner canopy with a beautiful pink and grey Painted Roses design. Length including handle 84cm. Gloss black handle. Although most of us love the sun, unprotected exposure can be harmful. Fulton's high performance waterproof fabric has been technically developed to block more than 99%. It is lightweight, convenient and benefits from a wind resistant design. The Bloomsbury Double Canopy Umbrella by Fulton features a plain black outer canopy, and an inner canopy with a beautiful monochromatic floral bouquet design. Length including handle 84cm. Black soft touch handle. The Minilite folding umbrellas is a compact folding umbrella manufactured by Fulton featuring a stunningNational Gallery Print. Red handle. © The National Gallery, London. Length including handle 25cm. Rose Print Superslim Umbrella. Lulu Guinness. Made by Fulton Umbrellas for Lulu Guinness. Substantial cover for such a compact umbrella. Cylindrical compact case for easy use - cover with velcro side fastening. - Elegant double canopy with concealed ribs - Plain outer canopy with sophisticated print inside - Automatic opening mechanism - Steel frame. High performance polyester fabric - Length closed: 84cm, Span when open: 94cm Good condition (please see pictures). Note that I 'm leaving on the 11th of March until the 5th of April.Sorry for any inconvenience. Color: Black Fulton printed Wallpaper design Miniflat 2 folding Umbrella. This is made by Fulton - the Umbrella suppliers to the Queen! Wind resistant, high performance polyester/nylon fabric. Folded length 23cm. Fulton Bloomsbury-2 Walking Umbrella. This is made by Fulton - the Umbrella suppliers to the Queen! 94cm span when open. Toys and Interiors Limited. UNSUITABLE GOODS. A. Yes we can. Fulton printed Wallpaper design Miniflat folding Umbrella. This is made by Fulton - the Umbrella suppliers to the Queen! Toys and Interiors Limited. UNSUITABLE GOODS. Superslim-2 folding Umbrella, made by Fulton - the Umbrella suppliers to the Queen! High performance polyester fabric. Q. Can I collect goods from you?. 6 ribs - rib length 50cm. Minilite 2 folding Umbrella in Bird In Paradise design. Made by Fulton - the Umbrella suppliers to the Queen! 96cm span when open. Toys and Interiors Limited. UNSUITABLE GOODS. Matching sleeve. Superslim-2 folding Umbrella, made by Fulton - the Umbrella suppliers to the Queen! Q. Can I collect goods from you?. Toys and Interiors Limited. UNSUITABLE GOODS. This is a Fulton Soho-2 Umbrella. This is made by Fulton - the Umbrella suppliers to the Queen! Closed umbrella length - 18cm. Span when open - 94cm. Toys and Interiors Limited. UNSUITABLE GOODS. Minilite 2 folding Umbrella, made by Fulton - the Umbrella suppliers to the Queen! 96cm span when open. Q. Can I collect goods from you?. Toys and Interiors Limited. UNSUITABLE GOODS.